Here's another late October sale as Neal Esterly at Fraser Yachts tells me his joint listing with Patrick McConnell, the 29m motor yacht Safari, sold last month with Al Hicks of Tri-Shore Yachts representing the buyer. Built in 1997 by Nordlund, she has been constantly upgraded and professionally cared for, and had a new exterior paint job at Nordlund in November 2010. 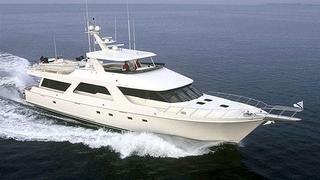 She sleeps six guests in three staterooms and her interior by Pokela Design exudes comfort and quality. The varied textures of burled maple, madrone, marble, stainless steel and glass, are an elegant counterpoint to the yacht's modern lines.